During an interview with KLAS-TV investigative reporter George Knapp, former U.S. 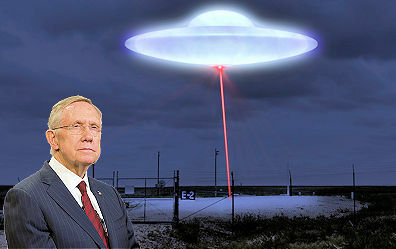 Senator Harry Reid (D-NV) acknowledged that among the UFO cases scrutinized by the newly-revealed Pentagon UFO project were those involving UFO incursions at U.S. Air Force ICBM sites. In an email to me, Knapp said that the specific incidents studied were the so-called “Northern Tier” cases, occurring at Strategic Air Command bases in October and November 1975. Those events have long been a matter of public record via documents released to researchers using the Freedom of Information Act in 1977. The files, together with testimony from USAF veterans interviewed by myself and others, confirm a series of sightings by security personnel of anomalous aerial objects maneuvering near ICBM sites operated by Malmstrom AFB, Montana, as well as at nuclear Weapons Storage Areas (WSAs) at Loring AFB, Maine, and Wurtsmith AFB, Michigan. One NORAD log entry pertaining to Malmstrom said that several UFOs were observed above Minuteman missile sites over a several-hour period on November 7th; one of them was described as an “orange white disc object”. According to the logs, as many as nine UFOs were tracked on radar and pursued, unsuccessfully, by F-106 fighters. As a result of this incident, as well as those at Loring and Wurtsmith, the Pentagon placed its entire nuclear force on a heightened alert status known as a Security Option 3. Actually, the Northern Tier cases are just the proverbial tip of the iceberg. Other declassified documents reveal ongoing UFO activity at nuclear weapons sites over a several-decade period, including incidents at the Los Alamos and Sandia laboratories, in New Mexico; the Hanford and Savannah River plutonium-production plants, in Washington State and South Carolina; weapons test areas in Nevada and the Pacific; and ICBM test ranges at Vandenberg AFB, California, and Cape Canaveral, Florida. These records are reinforced by now-public statements from American military veterans relating to UFO activity at virtually every nuclear missile and bomber base in the U.S. Over the past four decades, I have interviewed more than 160 U.S. Air Force veterans regarding their involvement in one or more of those incidents. An overview of the key cases is presented in my documentary film; a more comprehensive summary of the UFO-Nukes Connection may be found in my book. The Military Industrial Complex is now worried that space aliens will demand inspectors be let into the ancient silos or they might bombard the Earth with superintelligent well-informed voters. Unlike those theoretical voters, space aliens actually exist.